They were also kind of ugly. They don’t make for spectacular presentation, as can be seen in the photo. I think blondies are sort of inherently unattractive, because a yellow block with dark chunks just isn’t going to look super appetizing. 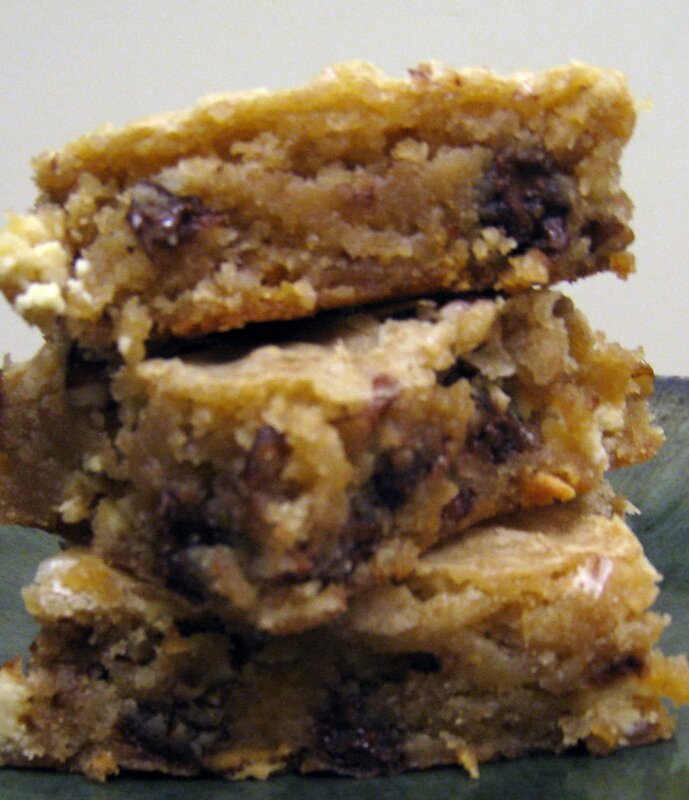 I had never made blondies before, having tasted one a couple years ago and written them off as dry and boring. But I’m moving soon, and I wanted to use up my various types of chocolate chips. Ignoring the fact that I would have to buy even more ingredients to bake these, I settled on this blondies recipe that includes them both! Anyhow, if you like gooey, buttery desserts (this is obviously rhetorical), then these are the absolute perfect things to make. I loved them and couldn’t stop eating them and had to rapidly give them all away. They turn out as slabs of what is basically melty butter cookie, studded with pecans and white and semisweet chocolate chips. As for the recipe, I honestly wouldn’t change a thing, I’m terrified to mess with something so delicious. My only notes are that the edges have a bit of a gummy texture, so I cut them off before slicing into squares (and then devoured all said edges! MWAHAHA!). I also think that toasting the nuts makes a real difference – I never used to, because I’m lazy, but it turns out it’s super easy and very much worth it. Preheat the oven to 350 degrees. Line a 13- by 9-inch baking pan with 2 pieces of foil or parchment paper. In a medium bowl, whisk the melted butter and brown sugar together until combined. Add the eggs and vanilla and mix well. Using a rubber spatula, fold the dry ingredients into the egg mixture until just combined. Do not overmix. Fold in the semisweet and white chocolate chips and the nuts, and turn the batter into the prepared pan, smoothing the top with a rubber spatula. Bake until the top is shiny and cracked and feels firm to the touch, for 22 to 25 minutes. (Don’t overbake!) Place the pan on a rack and let cool completely, then cut into squares (discarding edges if desired). You are currently reading blondies at one cake two cake.